Transnistria, a region half as big as the Greek island of Crete, is a narrow strip of land along the Dniester River and the border to Ukraine. The self-proclaimed republic separated from Moldova after a military conflict in Moldova. A ceasefire was declared but a frozen conflict has existed since 1992. International diplomatic efforts – recently intensified by Germany – to resolve the conflict have not brought about any changes. Today, about half a million people live in the breakaway republic. The region relies on financial assistance from Russia to survive and Russian troops have been stationed there since the Soviet era. From an international perspective, Transnistria is one of the poorest regions in Europe and notorious for being a smuggler's paradise on the edge of the European Union. In early 2014 there was some concern about a possible Russian incursion across Ukraine to occupy Transdniester. Ukraine reported up to a thousand saboteurs of the Main Intelligence Directorate (GRU) of the Russian Defence Ministry had been deployed to unrecognized Transnistria, who, presumably, had been tasked to destabilize Ukraine's south, Odesa region in particular. They were also said to be developing a scenario of capturing administrative buildings by armed men in civilian clothes to evoke a forcible response of Ukrainian authorities, provoking a border conflict and imposing the state of emergency or martial law. This would break the conduct of early presidential elections in Ukraine, which is one of the main goals of Putin. Military experts also pointed to the vulnerability for defense of southern Ukraine, located between the unrecognized Transnistrian and annexed Crimea. Russia, however, does not want to accept Transnistria. According to a foreign policy document signed by Russian President Vladimir Putin at the end of November 2016, Russia aims to give Transnistria a special status within Moldova. While Transnistria looks to Moscow, the present pro-West government in Moldova is seeking closer ties with the European Union. Russia still had around 1,400 troops in the territory. 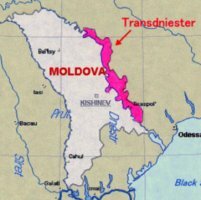 Transnistria (aka Transdniestria - a Russian translated version - or Transdnestr, Pridnestrove) is the long and narrow strip of Moldova bounded on the west by the Dnestr River and on the east by Ukraine. The predominantly Russian and Ukrainian population of Transnistria attempted in 1990 to secede from Moldova and has maintained a separate but unrecognized government since then, known as the Dnestr Moldovan Republic (and other variations), or in Russian as Pridnestrovskaia Moldavskaia Respublika - PMR - using the city of Tiraspol as its capital. The breakaway region has looked to Russia for unofficial support. Moldova has sought peaceful solutions to its ethnic and security problems, including offering the largely Russian population of the separatist Transdniester region broad autonomy. Bolstered by the presence of Russian troops, Transdniester continues to hold out for independence, thus denying Moldova control over significant industrial assets and its border with Ukraine. 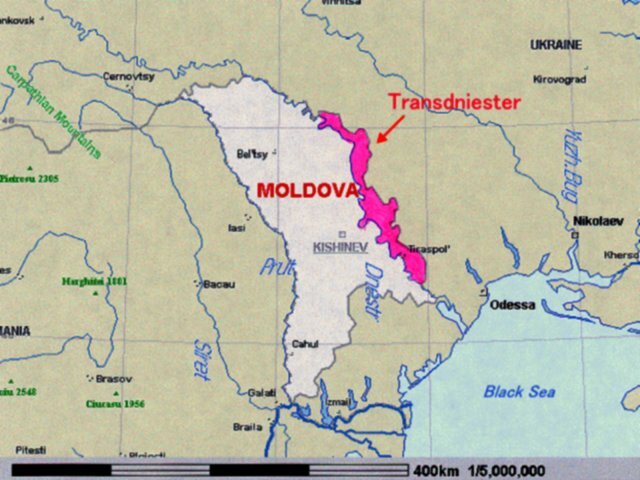 Transdniester -- a narrow stretch of land situated along the Dniester River between Moldova proper and Ukraine -- broke away from Moldova over fears the Soviet republic would seek reunification with neighboring Romania. In 1992, Moldova and Transdniester fought a short war that ended with a Russia-mediated settlement enforced by Russian troops already stationed in the region. No country has recognized the self-proclaimed Transdniester Republic. In early 1994, the government of the "Dnestr Republic" had armed forces of about 5,000 which included the Dnestr battalion of the Republic Guard and some 1,000 "Cossacks." As of early 1994, the Russian 14th Army (about 9,200 troops) consisted of one army headquarters, one motor rifle division, one tank battalion, one artillery regiment, and one anti-aircraft brigade. Their equipment consisted of 120 main battle tanks, 180 armored combat vehicles, and 130 artillery/multiple rocket launchers/mortars. Peacekeepers in Transnistria consisted of six airborne battalions supplied by Russia, three infantry battalions supplied by Moldova, and three airborne battalions supplied by the "Dnestr Republic." The Russian arsenal in Transdniester belongs to the former 14th Soviet Army -- later the Russian Army -- which has been deployed in the region for decades. The 14th Army -- which changed its name to the Transdniester Operative Group of Russian Troops -- still has some 2,500 soldiers in the region, which Moscow says are necessary to guard the weapons and ammunition depots. Under growing international pressure, Russia at a 1999 OSCE summit in Istanbul signed the adapted Treaty on Conventional Armed Forces in Europe, under which it pledged to withdraw all its troops and military equipment -- estimated at 50,000 weapons and more than 40,000 tons of ammunition -- from Transdniester by 2002. Much of the armaments, as well as the ammunition, were produced before World War II. About 2,500 Russian troops remain stationed in Transdniester as of late 2003. Transdniester has a president, parliament, army and porice forces, but, as yet it is lacking International recognition. The official languages are Russian, Moldavian, and Ukrainian. Constitutional system: Trans-Dniester Moldavian Republic is an independent democratic state. Trans-Dniester Moldavian Republic is situated between the Republic of Moldova and the Republic of Ukraine. Territorially the state encompasses areas on the left bank of the Dniester river, the town of Bendery and some villages on the right bank. The capital of Trans-Dniester Moldavian Republic is Tiraspol (population 194,000 as of 1 September 1999). The distance from Tiraspol to Odessa is 100 km., and the distance from Tiraspol to Kishinev is 70 km. Trans-Dniester Moldavian Republic has economic ties with many countries. The Republic exports its goods to 50 countries and imports from 40 countries. The Republic produces such export-oriented and well-known abroad kinds of goods as rolled steel, foundry equipment, electrical energy, cables, large electrical machinery, low-voltage gear, insulating materials, pumps, cement, furniture, textiles, footwear, ready-made garments, wine, brandy and other goods. Transdniester separatists' have a long-time involvement in money-laundering and the manufacturing and smuggling of weapons, as well as trafficking in human beings and drugs. Secessionists in Russian-speaking Transdniester maintain control over the enclave's borders with Ukraine, across which most of the smuggling takes place. The region's leader, Igor Smirnov, and his son, Vladimir, are believed to have almost exclusive control over the lucrative criminal activities in the area. Since the Soviet collapse, as much as half of Transdniester’s working-age population has left - to work in Russia, or in the West. But Transdniestrans seem happy to live as Russia’s lost colony in Central Europe. Russian Deputy Prime Minister Dmitry Rogozin warned in September 2013 that if Moldova made a move towards the EU, it can say goodbye to the Transdniester, the secessionist region guarded by 1,200 Russian peacekeeping troops. In December 2013, Transdniester passed a law mandating Russian-language legislation, saying the separatist region's major goal is integration into the Russia-led Customs Union. One month after the presidential elections in Moldova, where the pro-Russian socialist leader Igor Dodon won, the internationally unrecognized separatist state of Transnistria voted 11 December 2016 for its own president. Current president, Yevgeny Shevchuk, and parliamentary speaker, Vadim Krasnoselski, have the best chances of winning. A Russian poll had Shevchuk ahead. This is the second time 48-year-old president Shevchuk is running for president. He began ruling Transnistria in 2011 when he succeeded Igor Smirnov, who had ruled the separatist Moldovan region for two decades. "People put high hopes in Shevchuk, but not all of them have been fulfilled," said Galina Schelar, a political scientist in the Moldovan capital of Chisinau. The crisis in neighboring Ukraine has left its mark. Furthermore, tensions between the president and parliament have grown. "People are waiting for election day because tensions are running high," said Natalia Skurtul, a journalist in Transnistria. "Many are dreaming of the election campaign just being over." Shevchuk's main opponent, Krasnoselski, enjoys the support of "Renewal", an opposition party that entered a partner relationship in the summer with the Kremlin party "United Russia." The 46-year-old Krasnoselski is backed by the powerful corporation "Sheriff" where he once worked as head of security. Sheriff operates a supermarket chain, gas stations, a mobile phone provider and a television station. Both Shevchuk and Krasnoselski are in favor of joining Russia. The vast majority of Transnistria inhabitants voted for this in an internationally unrecognized referendum. In the Transnistrian capital, Tiraspol, there have been signs of movement toward Moscow. In September 2016, the president issued a decree to adapt the Transnistrian legal system to the Russian one.